India is one of the fastest growing country in the world.It is marked as second largest in population where China is in the first. Economy and technology are the main two sectors where India feels proud for development.A lots of responsible government official have declared various time that the governance will provided to all citizens of India.E-economy is a main factor of the Government's so-called e-Governance.I have no doubt it will make our life easier.If this works fine then nothing to worry for our services.A large portion of our citizens use these government websites which are intended to provide services.When any one enter these websites,he or she will feel the traditional system was much better than so called e-governance.These websites are cluttered with navigational issues,poor design,usability flaws and are hardly updated once in a year. 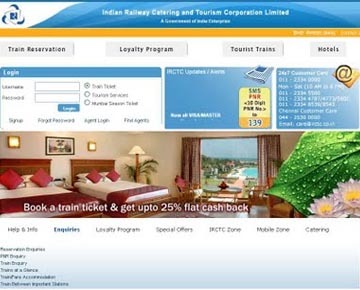 Indian Railway Catering and Tourism Corporation website is one of the most visited government website India.It has created history for the first government website that launched a mobile application for easy access through the phones. It might be the number one website where 80% users leave with out getting their information due to lack of service unavailable or slow navigation. 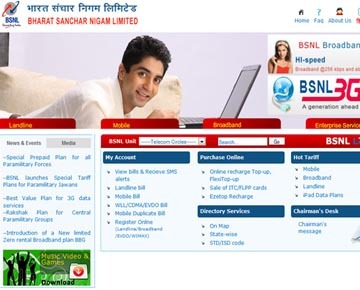 Bharat Sanchar Nigam Limited(BSNL)’s official portal seems to be faster than the earlier one and is comparatively clutter free.But the content in the website is poorly sorted and designing also so poor.Another most thinking matter that their online payment system so poor service provider. 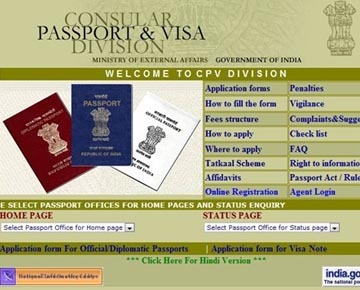 Passport is one of trust worthy documents in the world.When any one tries to apply for one through the Indian Passport website handled by the ministry of external affairs then he or she will leave the process in with out finish and thinks to go through traditional process due navigation and submission process. Mahanagar Telephones Nigam Limited is another Government website which usually takes more than five minutes to load and even if it is loaded then users who has experience of early 90's websites surely memory brings the past browsing experience of websites. 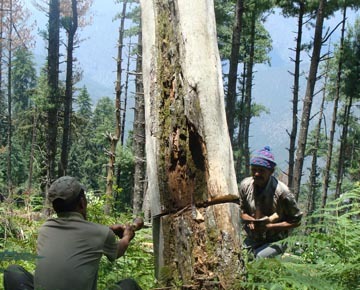 The environment ministry of India has claimed better website than other counterparts but it has the un-aligned boxes of information in the home page.When users enter the home page then surely surprised for back dated information which are more than 12 months older. 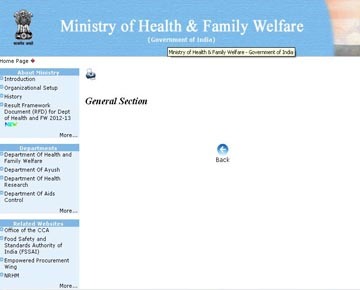 Health and family welfare department has created the website with 60 active links but most of the links show 'coming soon' which is very shameful to us(as we,the Indian IT professionals,creating websites for aboard countries' but our own....).Some time it shows or redirects users to some files or links outside the network. 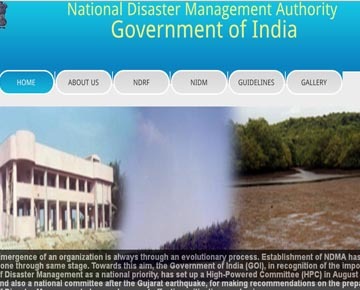 The National Disaster Management Authority (NDMA)website is itself a disaster because the site is an extreme example of poor design with the tabs and names overlapping with one other and the ill designed cursors.The header portion of the site is covered with blurry flash which has unrecognizable next and previous buttons.Once any one enters the site then he /she never goes there again. 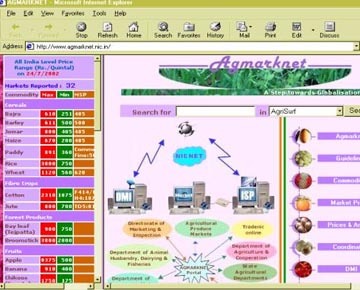 The Agmarknet says in home page that a step towards Globalization of Indian Agriculture. The site allows the users to check prices of agricultural goods all over in India but you can get same value for all places in a state but reality is very far from that value. Another interesting thing is that the value will remain same all most 30 days where the changing is come with in hour in real market. MCA is one of the highest visited government website in India which regulates companies, stocks and shares.Details of protection for investors,policy and administration details.When users try to get own information it takes more than 5 minutes to load a single page.If want to submit any information than it is sure that he/she has to submit a few more times unsuccessfully due unavailable service or slow navigation. The HRD department website has been called one of the jumbo links juice which has no systematic order of data.As we know that India is very large country,so needs some extra care for data storing and order facilities for every each region or place or university.But any users want to find a single data from that site which needs more than 5 times as other private websites provides the same with in a few seconds. We hope that ministry of Information Technology will look after the Indian Government websites and take necessary steps for better performance in near future.We feel proud as Indian,not for satisfaction but really we have done some thing extra than other.We urge our technology expert to protest these negligence with proper manner.